Almost two years ago Stella James thought she was set for the life when she won the National Lotteries Authority âSet For Lifeâ final draw. Overwhelmed with excitement, she never thought that getting her groove back with winnings worth EC$500,000, could become a burden. The New Grounds mother of seven girls thought that her winnings would have given her a new lease on life, rejuvenated hope and renewed aspirations after years of seeing them wane. But almost one year and eight months after receiving her prize from the National Lotteries Authority she is upset and frustrated. Jamesâ prize was officially presented to her on October 6, 2004. The 44-year-old woman claims to date she has not received the title deed to her property. She said when the house was given to her on October 6, 2004, instead of receiving a furnished house she received an empty house. 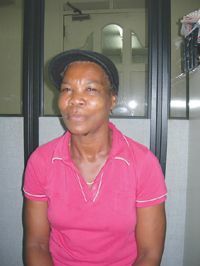 James did not move into her new home until October 2005, but on January 19, 2005 three months after officially receiving her property, James said she received a notice from the Central Water and Sewerage Authority (CSWA) stating that a very high consumption ($590) had been registered, and as a result, the water had been disconnected. James also complained about cracks around the foundation, but when SEARCHLIGHT visited the home on Wednesday, no cracks in the foundation were observed, rather it was the pavement around the house that had separated from the building. James also expressed frustration that the solar water heater had not been connected to the water pipes. âI am trying not to wrench up, because my head getting hot, but me sure that me nah ah lef um so,â said James. When contacted, McGregor Sealey, Manager of the National Lotteries Authorities (NLA) explained that the media can attest to the fact that James was given a perfect house when it was handed to her. He disclosed that the NLA is currently working on the title deed. He explained that it is not being done as speedily as expected because it might have been held up as a result of bureaucracy. Sealey also disclosed that when SEARCHLIGHT contacted him, it was the first time he was hearing about the cracks and the situation with the water, and James should address such problems with the contractor who built the house. The Nissan X-trail, still covered with plastic sheeting is up for sale at a price of $80,000. The SUV, whose battery is now dead, was never used, as it is Jamesâ belief that the vehicle should have been insured and licensed by the NLA. At present James and her family of 7 source water from a nearby river and from a neighbour. She said she will be seeking legal redress.